Sometimes keeping it simple is the shortcut to getting it all wrong. While I am a believer in mastering all master data domains under the same vision and strategy, there are still best-in-class options when it comes to orchestrating processes and applying technology in the right chunks. A recent post on this blog was called What Happened to CDI? This post examines the two overlapping disciplines Master Data Management (MDM) and Customer Data Integration (CDI). In a comment Jeff Jones argues that MDM vendors have forgotten about proper CDI workflows. Jeff says: “It seems the industry wants to go from Source to Match/Merge, instead of Source to Match/Identify and finally to Merge.” Please find and jump into the discussion here. Also, this question was touched some years ago in the post The Place for Data Matching in and around MDM. The product domain within Multi-Domain MDM also holds some risks of forgetting the proper ways of handling product information. In this domain we must also avoid being blinded by the promise of a single source of master data with surrounding processes and applied technology. There are many end-to-ends to cover properly as exemplified in the post A Different End-to-End Solution for Product Information Management (PIM). No, this is not an(other) attempt to challenge Gartner, the analyst firm, in making quadrants about vendors in the Master Data Management (MDM) realm. 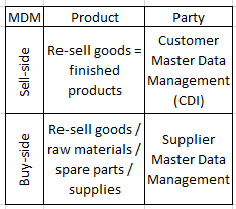 This an attempt to highlight some capabilities of Multi-Domain MDM solutions here focusing on party and product master data and the sell-side and the buy-side of MDM as discussed some years ago in the post Sell-side vs Buy-side Master Data Quality. The upper right corner is where MDM started, being with solutions back then called Customer Data Integration (CDI). Retailers and distributors have their challenges with sometimes high numbers of products that goes in and comes out as the same but with data reflecting different viewing points. Manufacturers have other issues managing raw materials, semi-finished products, finish products and products and services used to facilitate the processes. 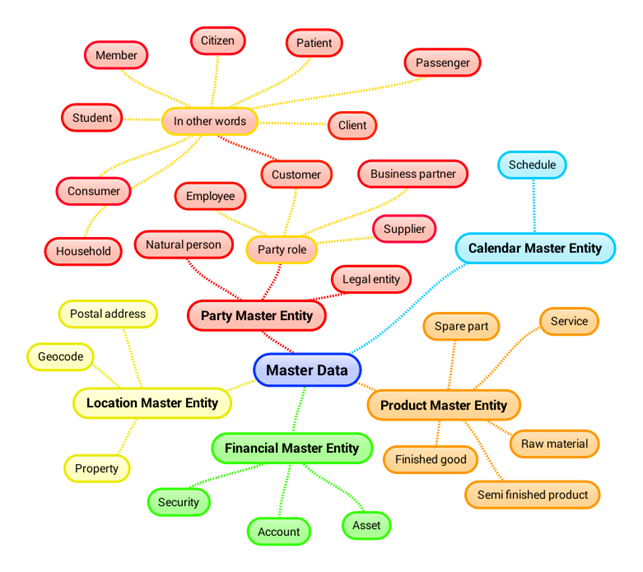 The supplier master data management has more or less also been part of the PIM space but looks more like customer master data and should be part of a party master data discipline also embracing other party roles as employee. These days I am attending the Gartner MDM summit in London. MDM (Master Data Management) initiatives and MDM solutions are not created equal and different ways of slicing the MDM world were put forward on the first day. Gartner is famous for the magic quadrants and during the customer master data quadrant presentation I heard Bill O’Kane explain why this is a separate quadrant from the product master data quadrant and why there are no challengers and no visionaries. Business-to-business (B2B) customer MDM, Product Information Management (PIM) and other domains. The vendors in general seems to want to do everything MDM. Stibo Systems, a traditional PIM vendor, presented the case for multidomain MDM based on how things have developed within eCommerce. Stibo even smuggled the term omnidomain MDM into the slides. A marketing gig in the making perhaps. The megavendors has bought who ever they need to be multidomain. Some new solutions are born in the multidomain age. Semarchy is an interesting example as they are so the evolutionary way.